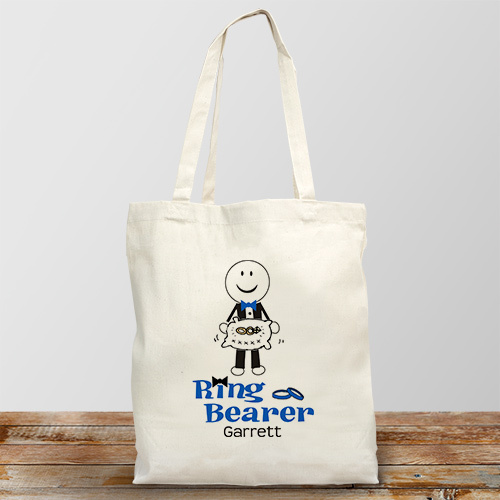 Show your appreciation for your ring bearer on you wedding day with our Custom Printed Ring Bearer Tote Bag. Your ring bearer will be able to use this stylish tote anywhere he goes and will bring back all the memories he had while being your special ring bearer. Personalize your Ring Bearer Bag with any name. Perfect given to a baby ring bearer put reading books for babys Mother loved it she will use it the day of the wedding for baby items. Traveling to sporting events, going to school or visiting with friends just got a little easier with a Personalized Sports Bag from GiftsForYouNow.com. We specialize in Unique Sport Gifts for kids of all ages. Whether you are looking for Personalized Sports Apparel, Custom Athletic Gifts or cool Personalized Sport Gifts, GiftsForYouNow.com is the right choice at the right price.